You will find our frequently asked questions here. If you don’t find what you are looking for, we are only a phone call away. 800.413.8681. Escape games are adventures in which players find clues, crack codes and use their sleuth prowess to solve a series of puzzles within 60 minutes. Escape rooms originally began in Japan and have now reached the United States. Come try a Big Escape Room today! We’d love to see you here. Each game is 60 minutes long, we have a monitor in the room with a countdown of the remaining time. What’s the goal of a Big Escape Room? The goal of a Big Escape Room is to escape by solving the puzzles, riddles and cracking codes. These will ultimately lead to a code to open the door. To book a game visit our Booking Page, select your room and fill in your payment information. Once the form is completed you will receive a confirmation email for your records. You can also book at our location but please check the availability to ensure that there are spots available, please note that we do not accept cash. No bookings will be accepted over the phone. To pay for your order, fill out the form at our Booking Page and enter your payment information via credit or debit card. We welcome everyone to try a Big Escape Room! However, because of the nature of the puzzles we require an adult present in the room for children under the age of 13. If you group has children under the age of 8 please book a private room. Please arrive 15 minutes before the game begins, this will allow you to check in and get a briefing on the game. If you arrive later we will try our very best to accommodate you but will be unable to guarantee it. Absolutely not, if you need to leave the room at any time you have the option to leave and return within the 60 minutes. No, all the clues you need will be in the room. If you are under 16 please bring the waiver signed by your parent/guardian. You can find the waiver here. Yes. We use cameras to monitor the game, give you clues and ensure that you have a wonderful experience! Our game masters will help and guide you if you are stuck in the game. You also get three clues from the game master that you can use at any point. What if we don’t book all the available spots for an escape room? If your group doesn’t book all of the available spots in an escape room it will stay available for other groups to book as well. You could possibly be paired with another group. If you want to book an entire room, you will need to purchase the maximum capacity for that specific game room or select the private event option when making your booking. Certainly, if you would like to have a private event please select private event when making your reservation. This will ensure that it is just you and your group in that specific game. Yes. You can make your from our book now page. Once there you can see the available games, times and the number of spots left for each time slot. Once the form is completed you will receive a confirmation email. Note that you may be paired with other players if you do not book the entire room. We take every major credit card through our online booking page. You can also pay at the location but please check to ensure that there are spots available for that time and game. No. You may take your phones into the room with you or leave them in our secure lockers. 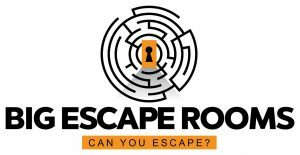 Big Escape Rooms is location at 8505 Fenton Street, Suite 210, Silver Spring, MD 20910. Our games vary in difficulty but packed full of fun! We host a variety of large events from corporate team building activities, birthday parties, youth groups and more. Please contact us for discounted rates and more information. All of our escape games have a minimum of 2 players and a maximum of 10 players. You can only play one game per hour, but you are welcome to book as many rooms as you would like. Make it a marathon! Yes, all our rooms are handicap accessible. All bookings and games are non-refundable. Cancellations, no-shows and late arrivals will not be reimbursed. To ensure a positive and fun gaming experience, please arrive 15 minutes prior to your time slot. If you are unable to make a particular time slot we will try our best to accommodate you and reschedule your game if you give prior notice. Yes. You can give your tickets to another person. Just give us a call at 800-413-8681. Sorry, but all sales are final.